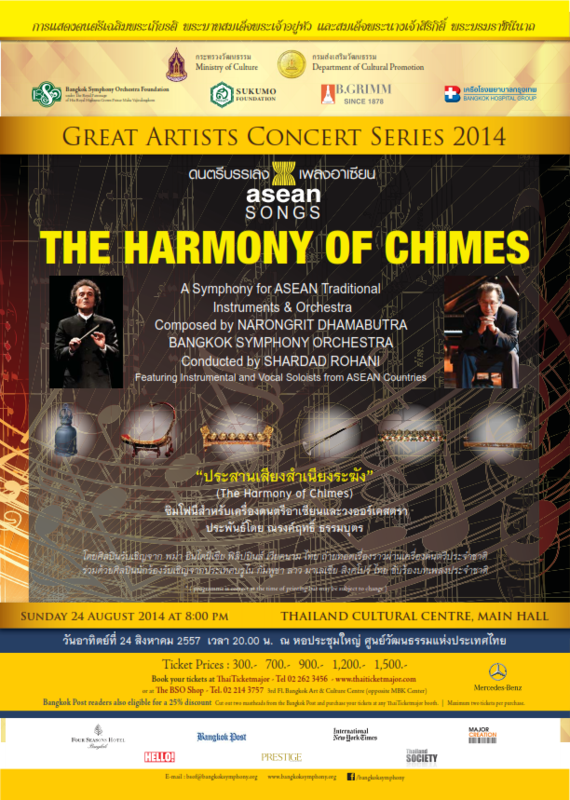 Please be invited to attend the Bangkok Symphony Orchestra concert, featuring �The Harmony of Chimes�, celebrating 2015, the year of ASEAN Economic Communities (AEC), on Sunday 24th August 2014 at 20:00 at Thailand Cultural Centre�s main hall. 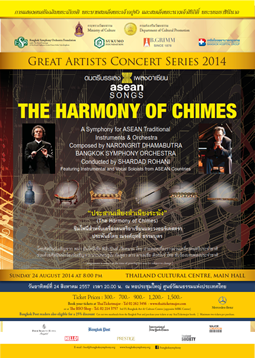 I have composed �The Harmony of Chimes� in 2014, involving 5 traditional instruments of Southeast Asia region, Saung Guak, Bonang, Pii-nai, Kulintang, and Dan Bao along with symphony orchestra, �The Harmony of Chimes,� presents the musical culture of the region in a 45-minute performance. The title evokes the composer�s inspired notion that the musical divergence each nation bears, could be combined through a homogeneous sonority of Chimes, a musical constant of the Southeast Asia region. Through the sound of Chimes, each nation is united in a brotherhood. Traditional melodies of each country are drawn as the underlying structure with a fabulous mingling of a contemporary musical language. 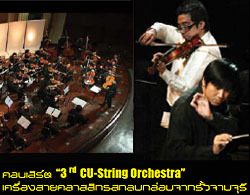 This symphony is not an arrangement of folk melodies, but a product of a newly creative contemporary work. 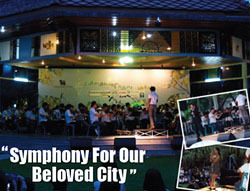 Through this kaleidoscopic sonority, the audience is transported through the region of Southeast Asia where the composer intends to depict the magnificence of the land and culture. Structured in 7 movements, The Harmony of Chimes, is comprised of �The Chimes,� an opening movement setting the atmosphere of the region; �Thazin Orchid,� the solo Saung Guak depicting the national flower of Myanmar; �Wayang Kulit� pictures the Indonesian shadow puppet performance through the instrument Bo nang; in �Naga,� the fourth movement, Thai Pii-nai conveys the mysterious Naga of the Khong river; �Mt. 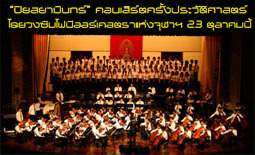 Apo,� a sacred volcano of the Philippines is presented by Kulintang; the sixth movement, �River of Nine Dragons,� has Dan Bao portraying the splendid Kong river in Vietnam; �The Harmony,� a final movement ends the composition by having all the instruments perform united as one, presenting the harmony of the region in a benevolent friendship. 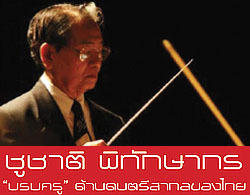 Professor Dr. Narongrit Dhamabutra is a respected Thai composer, recognized at both national and international levels. 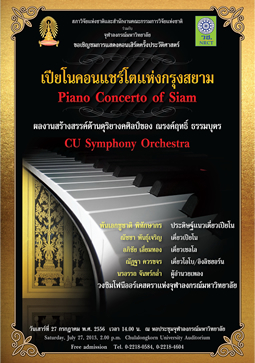 His major compositions include the Concerto Maharaja for Ranad-ek and Orchestra, Symphony Piyasayamintra, Concerto Sankitamankala for violin and orchestra, Piano Concerto of Siam, etc. 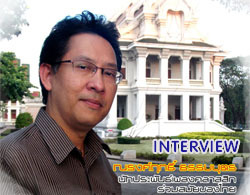 All of his compositions are the product of the interaction of East-West musical cultures. "A composer needs to find his own 'signature'. 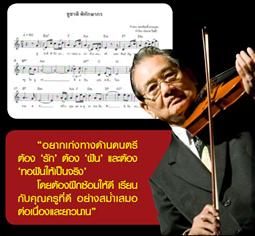 He must put all his 'brain' and 'heart' into each music piece he composes -- with all his imagination and dedication. Furthermore, he must open up his mind to listen to others' music."